Happy Monday! For Q&A Monday I'm answering a question that I've actually been meaning to do a post about…well…forever, sadly. So I'm glad for the push to finally get around to doing it! (P.S got a question for me? Drop it in my Q&A Box!) Today is all about divine up spending responsibilities in your family! 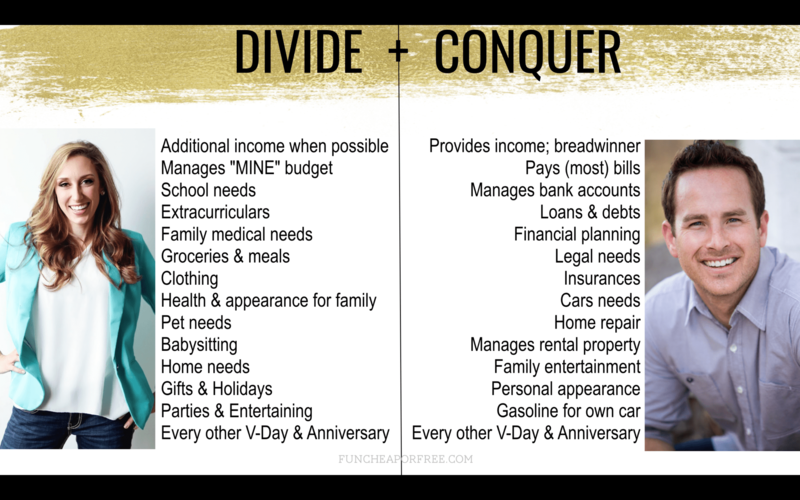 Have you ever thought about why you fight over finances? It's because you probably have different ways of doing things, thinking about things, and different priorities. To keep your family finances running efficiently and smoothly, and to help you stay on-budget (and fight less!) 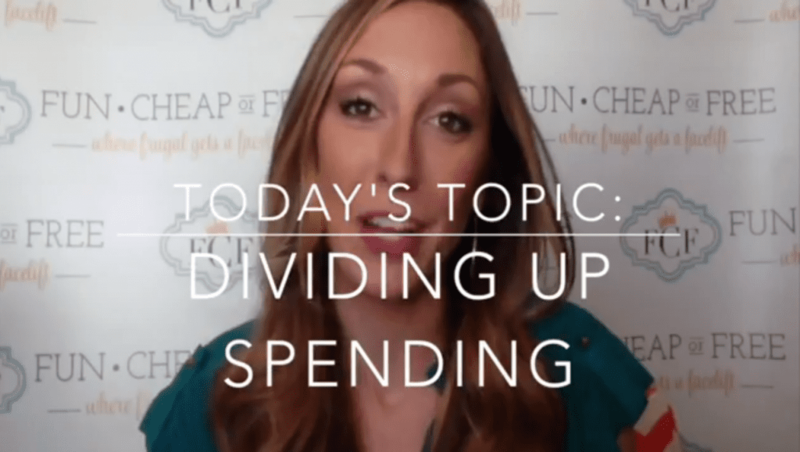 I suggest dividing up spending responsibilities so you aren't stepping on each others' toes! Yes, you are all working for the same team and the same common goal, but by dividing up, you're making sure everything is covered, and it gives everyone the chance to track and manage things their own way. Any successful company doesn't have two CFO's or two CEO's or two CMO's. Why? Because it's not efficient! And they would want to kill each other because everyone has their own way of doing things! The best thing to do is to give everyone their own roles and responsibilities based on their skills, interests, talents, and what they do on a typical daily basis. STEP 2: Grab 2 highlighters, assign one color for each person, and don’t stop until every item on your list is divided up! This DOES NOT mean that you can’t help each other and that you shouldn’t be involved with the financial decisions of your family, it simply means that ONE person is in charge of the responsibility, tracking, and spending…but remember, you’re all working toward the same common goal! STEP 3: Set a budget and take charge of your responsibilities! You need to set a budget for each item. Yes, you can lump them together. Get a good idea on how we do this HERE and how we track our budgets HERE. Take charge and track the budget for this responsibility, which also typically includes doing the spending, finding the deals, and monitoring the saving up for (if needed). I also think it's important to dedicate ONE breadwinner and learn to live off of their income. That doesn't mean you can't both work, but by living off of ONE income it helps you prioritize your lifestyle, and will help you stay on-track and safe financially. It also gives the second money-maker the flexibility and option of staying home with the kids someday if they so desire. If you're used to spending 100% of your combined incomes, you will be forever stuck with having two full-time workers in the home. Set ONE breadwinner, stock the other income away toward debt first then savings second, and you'll have security and flexibility that is invaluable. I am a single woman, but I love the way you have divided spending between you and your husband so that nobody gets in the other persons way. Divide and conquer!! I have this week off and I am browsing through your website to get me some good tips for saving money. Singles need to be frugal too, especially when they only have a part time job and want to build a home based business like me. Thank you so much Jordan, you are not only very beautiful on the outside but also tremendously wise. I am sure your husband is very proud of you! My web site looks weird when viewing from my iphone4. I’m trying to find a theme or plugin that might be able to correct this problem. Yay! I love this. It is easy, and very doable! Is it terrible if I fee like I am the President of our finances and my husband is the Vice President? He is the kind of person that is a “team player”—do s what he is told, follows through, etc. but hates to make the final decisions and take charge. I, on the other hand, am very goal oriented and organized and I have plans for our money and Family! So, is it bad if I say “here hun, these are your responsibilities” instead of it being mutual? It’s just so hard to make think this way that it is easier just to assign/delegate rather than be co-decision makers. I hope that makes sense. Thanks for any advice!